I wrote a piece for Strategy Magazine's Next Big Thing Issue about consumer culture on the emerging market for privacy. One of the pitfalls of prognostication is that we often tend to start with emerging technologies - which makes sense because they are new - but these are subject to hype cycle problems. Even in a culture of diminished latency such as ours, cultural adoption doesn't move quite as fast as information now can, in part due to the segmentation established in the Diffusion of Innovations - some people are just not neophilic as others. But also due to the ecosystem effect, which is a bit like the network effect, in that the more pieces of the ecosystem that can inter-operate, the more useful they all are, and the more people use them, the cheaper they become and so on. That's why I was fascinated to read about Nest Smoke Detector, since it's clear the second piece in a rather beautiful looking smarthome ecosystem. The privacy debate continues to rage, and has been for a long time in technology and media circles, but the shattering news of PRISM brought total surveillance discussions to the mass market, which I suggested might created new opportunities and threats for marketers, and indeed new consumer markets. I wanted to talk about Dazzle camoflage but didn't have space on the page. In World War I and II, Dazzle ships were camoflaged in a really interesting way. Instead of trying to conceal the ships, they were painted in complex geometric patterns that intersected each other, to make it harder to estimate the ships location and speed. To make sure the enemy couldn't use the pattern to identify any class of ship, each pattern was unique. Which is what I was trying to say about digital privacy in the piece below. Since not being in the water is no longer really an option, living so much online, surveilled by drones on the street, one other way of thinking about privacy is create so much noise that you dazzle the data. A PEW Research Center study found that half of American consumers don’t care about electronic surveillance. The other half (unsurprisingly) does. This represents the potential for a new mass consumer market and a newly elusive target audience. Technology company Parrot sells consumer “Drone Quadcopters” for a few hundred dollars that stream and record HD video of the ground below to your smartphone, letting you record and review simultaneously. 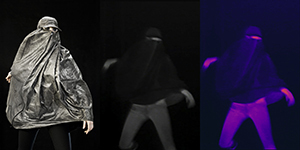 On the flip side, New York artist Adam Harvey recently unveiled a concept he calls “Stealth Wear” – clothing that uses reflective fabrics to dazzle surveillance, hinting at a new kind of fashion statement. The Electronic Frontier Foundation, a digital rights activist group, has long espoused using pretty good privacy (PGP) encryption and Tor (anonymous routing) to protect your digital life from prying eyes. This is technically beyond the majority of casual web consumers, who are looking for more user-friendly solutions. So Microsoft recently leveraged these security concerns to reposition its much maligned Internet Explorer, which, in its latest release, defaults to preventing tracking cookies, causing controversy among digital display advertisers increasingly hooked on targeting. The next big thing in consumer culture isn’t privacy: it’s personal spam. As we move forward, more consumers will create a cacophony of noise to drown out their real signals. Brands that want access to this stealthy set of consumers and their data are going to need to find new and smarter ways to earn their attention and information. Faris Yakob is founder and principal at Genius Steals LLC and the co-author of The Digital State: How the Internet Changes Nearly Everything. Memory Hacking is the title of a piece I wrote for FastCompany's #travelbrilliantly branded content series about the future of travel. In it I steal from Daniel Kahneman, and consider some of the broader implications of his thinking, fast and slow, and the TED talk above [which is wonderful] for how we think about, plan and experience travel. Our memories are slippery things. The brain [well the conscious mind anyway] forgets, well, pretty much everything, except salient elements to the narratives it creates for us, but it creates an illusion of continuous verisimiltude. This is similar to how our eyes seem like they are seeing a direct stream of reality, when really they are filtering out a lot of information, and filling in gaps. [One of the easiest ways to experience this visual filtering is to look into a mirror and then look from your left eye to your right eye and back again a few times. You can feel you eyes are moving, and yet the eyes in the mirror don't move, because that movement is being filtered out. Further, each one is a continuously made recreation, as each engram is re-encoded every time we remember it. Eidetic, or photographic, memories, sound like a super power, but is often described by those that have it as a blessing and curse - if everything is recalled, all the bad comes with the good, in HD. This is cogntively analogous to the Facebook never forgets problem highlighted by Google's Eric Schmidt. He suggested that the internet needs a 'delete button' so that mistakes people make when they are young can't haunt them forever. Growing as person, in some sense, necessitates forgetting some aspects of who you were. Further, this week's inaugural Hippo Reads piece on HuffPo suggests that being able to deceive ourselves is a valuable life skill and indicator of success and happiness. Dan Ariely has pointed out that creative people make better liars and cheaters in essence because they are able to re-write their own memories, twisting the 'facts' they remember into they narrative they require to justiy their actions ti themselves - another way of hacking your own memory. You can read it over on Fast Company Creative Braintrust: Memory Hacking.